As I mentioned in my previous post, I spent most of Wednesday participating in a design charrette. 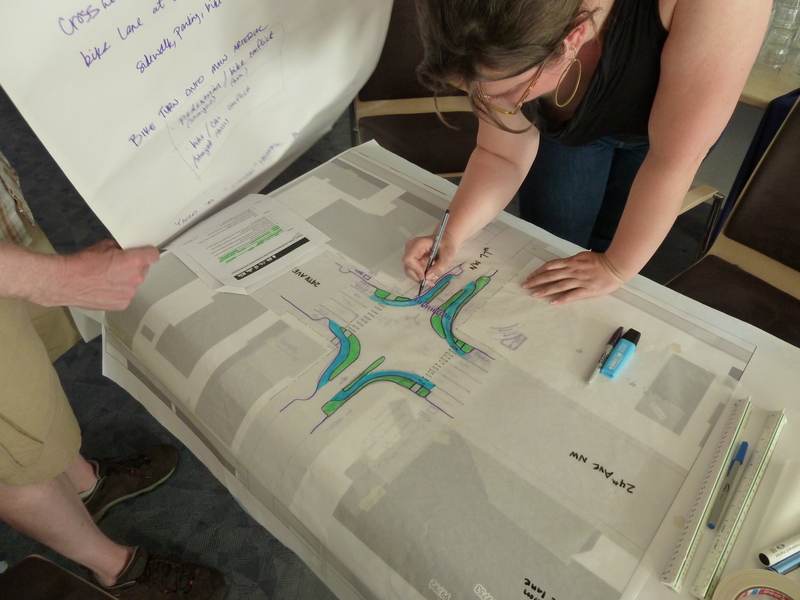 The purpose of the charrette was to brainstorm solutions to increase bicycling mobility while also addressing stormwater and water quality issues in Seattle. 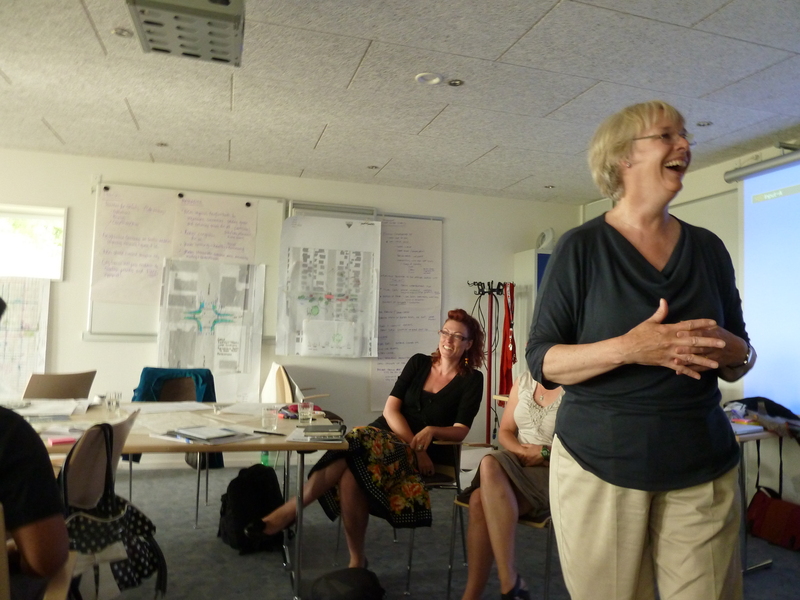 This charrette was organized for the 15 or so professionals who were part of an iSustain study mission focused on this topic as well as some experts from Copenhagen. The group included architects, planners, low impact development designers, Seattle City Councilmembers, leaders from the Cascade Bicycle Club, sustainability consultants, and some experts from the Copenhagen-based urban quality design firm, Gehl Architects. Let me start by explaining what the Right of Way (ROW) is and why it is important as we think about bicycle infrastructure and stormwater management. The ROW essentially refers to the city-owned property located between one private property line to the next. Streets, sidewalks, and green space comprise most of the ROW in Seattle. Legally, ROWs are defined as public spaces which people and goods have the right to pass or travel.1 Up until now, the majority of most ROWs are dedicated to car travel. But, more and more people are beginning to realize that ROWs represent valuable public spaces that could be used in more creative ways providing numerous social and ecological benefits. We broke up into three different groups and had three different real world ROW scenarios in Seattle that we were trying to improve based on what we had learned from efforts here in Copenhagen. 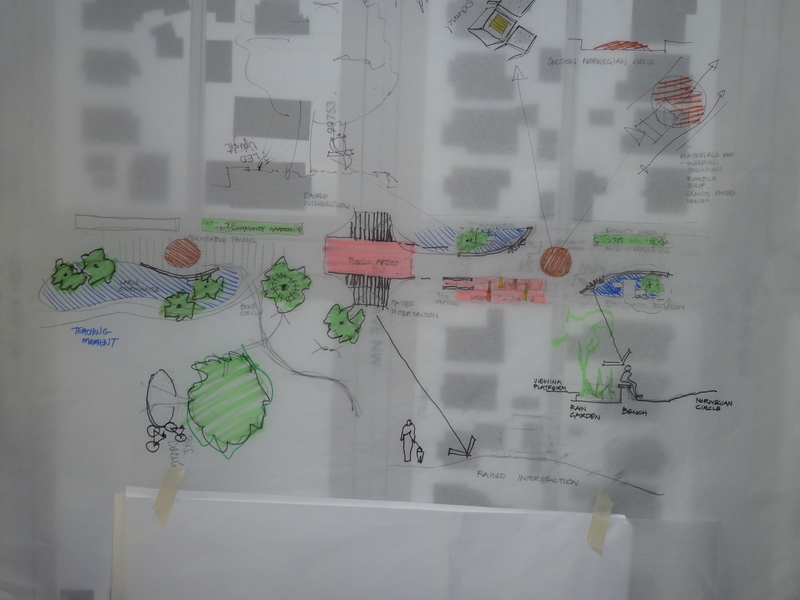 One group worked on how Neighborhood Greenways should connect different neighborhoods (e.g., how can we create a system of Neighborhood Greenways that would allow a biker to traverse all of Seattle without traveling on a street with a high volume of cars?). The next group thought about where Neighborhood Greenways within a neighborhood should be located to minimize the impact on car travel and maximize public acceptance. My group thought about transforming ROWs at the street scale and we came up with a detailed design alternative for a street and intersection in Ballard (24th Ave NW and NW 77th). We started by looking at the current street design and then used trace paper to draft design alternatives. I was surprised that the ROW on 77th is 60 feet wide. That’s a lot of space to work with! Currently car lanes and parking for cars take up most of this space. Our group redesigned the street so that some of this space could be used instead as bike lanes, community gardens, small playgrounds, contemplative spaces, and stormwater infiltration sites—while still allowing for cars to pass though. We also thought about visual cues that could be used to signal to drivers that they were not on a normal street and that car travel was not the priority here. We incorporated traffic calming features like circular speed-bumps (called Norwegian circles in Denmark), different paving materials for bike lanes and car lanes to signal who should be where, and signage letting all users know that they were in a Neighborhood Greenway. Our street design alternative to turn 77th into a Neighborhood Greenway. We also thought about the actual intersection between 24th and 77th. 24th is a very busy street and it was important to think about how bikers and pedestrians could safely get across 24th to continue enjoying the rest of the greenway on 77th. We redesigned the intersection to restrict car traffic and limit conflicts between drivers, bikers, and pedestrians by providing distinct lanes and signals for different users to cross the intersection. We talked a lot about the transportation hierarchy and the need to prioritize the “softest” users of the road. The softest users of the road are pedestrians followed by bikers and then car drivers. This “softest” user hierarchy hasn’t always been a priority to transportation planners and engineers—but it is essential for creating greenways where all people are comfortable getting out of their cars. We also added collection points for infiltration to minimize stormwater runoff—a serious problem in both Seattle and Copenhagen. This charrette got me thinking about a lot of other good stuff that I don’t want to cram into this blog post, but I will be adding more examples from Copenhagen of innovative ROW use. 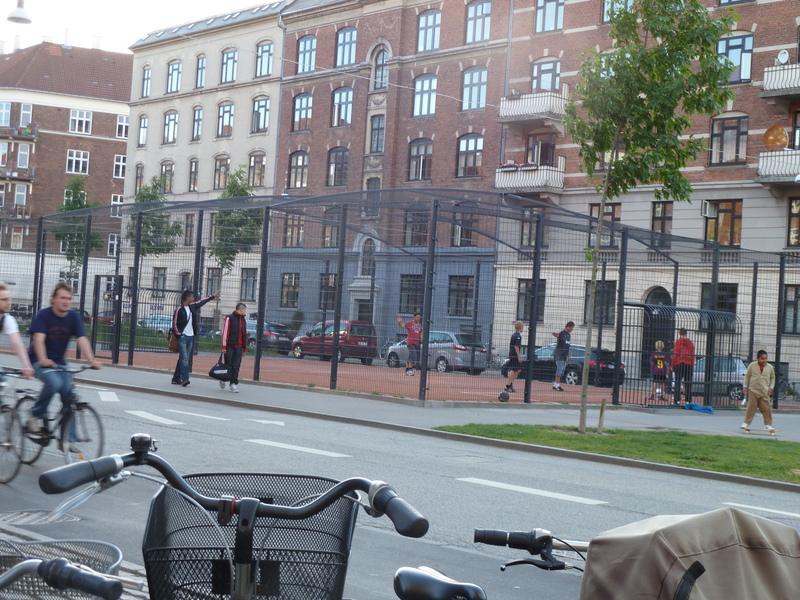 For example, just last night I was biking back to my hostel and I saw this great little soccer field. I took a picture of it and was thinking about my soccer team back in Seattle (go Medium Rare! ), but then I realized that this was a perfect example of a repurposed ROW. The City of Copenhagen could have made this street a 4 lane road where cars could speed through the neighborhood. Instead there is one lane for car traffic in each direction, bike tracks, sidewalks, outdoor cafes, and community spaces in the middle. A small soccer field instead of additional lanes of traffic for cars. The charrette work you describe is fascinating. Why don’t we use that process more often here in our own neighborhoods, with our neighbors, designers and policy makers participating? How likely is it, do you think, that Seattle will be able to use this process to transform ROWs, and, for example, implement the ideas you have for the Ballard space?